… or something. I’ve always stunk at math. It’s sort of working (?). Hard to say at this point. BUT! Luckily, I got a CSA share last spring that makes it really easy to square the number of veg eaten in a meal. Aaaaand that brings us to our lowly friend, the cabbage. Much maligned in erudite society, but a friend and ally of peasants (even urban ones, like me!) for centuries. Also, I love cabbage, so we’re pretty much in biznazzz. This is one small head of cabbage- maybe a pound and a half- and it fills to the brim my crock here, which I think is two quarts. 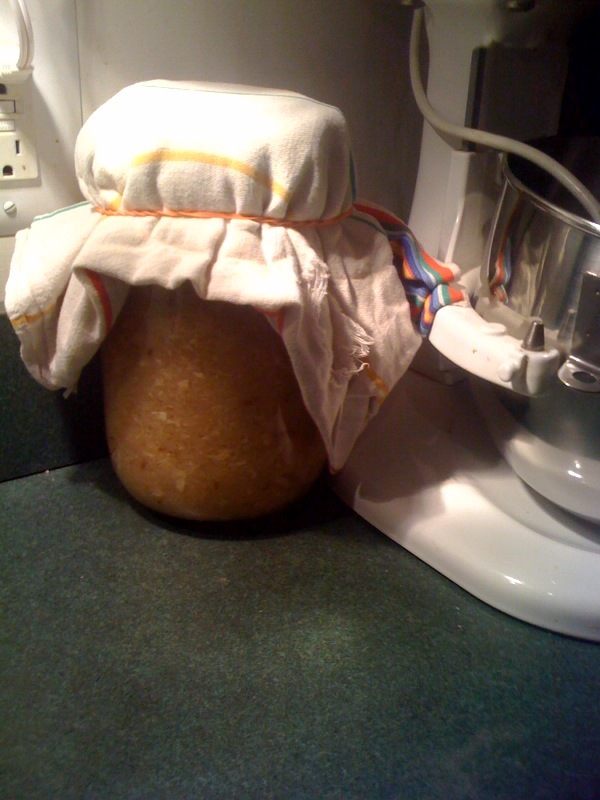 It’s been hanging out in its briney bath for about a month, and it should be ready to go into the fridge for the winter in about another couple of days. I use the guidelines from the brilliant Food in Jars blog, and you should, too. If you like sauerkraut. It’s so good when you make it- not so salty to throw off every other flavor it’s paired with, but definitely pungent and full of good bacteria for your gullet. Thinly slice some onions and a head of cabbage. Cook the onions in bacon fat (or olive oil, if you prefer, I guess) until translucent. 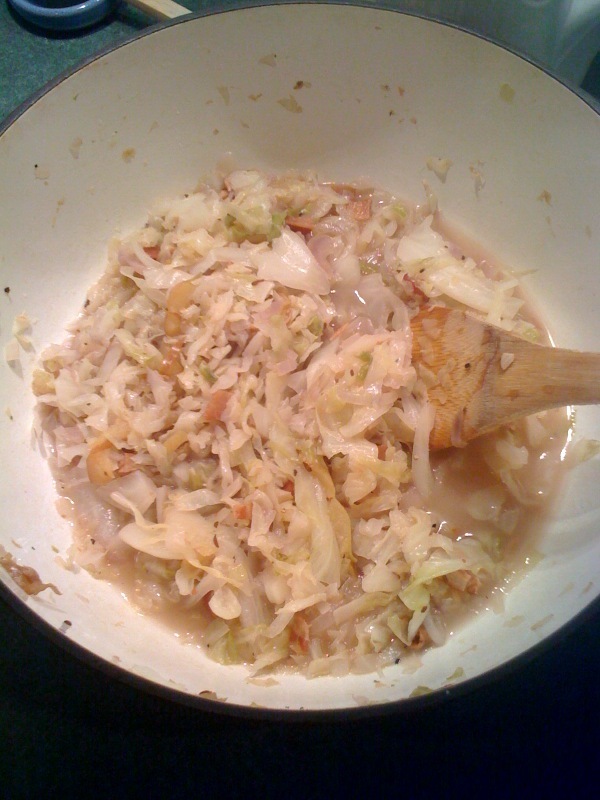 Add the cabbage, and cook for a few minutes until it starts to wilt. You want gentle heat here, medium at most. You could also add (as I usually do) a very thinly sliced apple. Leave the skin on, it’s good for you. Once the cabbage has wilted a bit, throw in about a cup (or a little less, this was a BIG cabbage) of water, apple cider, beer, or whatever liquid catches your fancy at that moment. Add some salt, pepper, and whatever else you want- red pepper flakes, caraway seeds, fennel seeds. GO WILD. Live on the edge. It’s cabbage. Cover the pot and cook for about 10 minutes on low, until everything is all yummy and melty. If you desire, you could cook it with the lid off to get rid of some of the liquid, but it’s totally personal preference. Right at the end, toss in about a tablespoon of cider vinegar (or something else tart and acidic- lemon juice would work, or another kind of vinegar). You can also stir in some cooked bacon, chopped nuts, brown sugar, or dried fruit- cherries are amazing in this. Taste for spice and tuck in, friend. 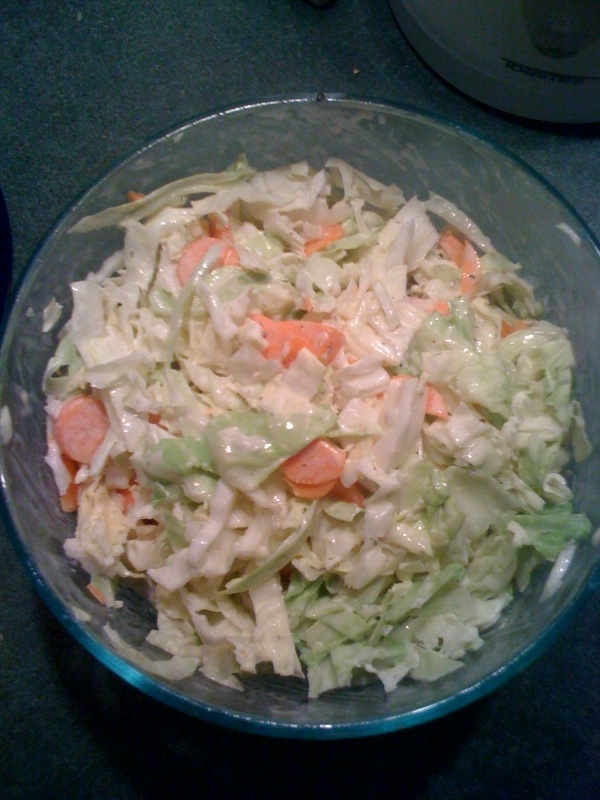 Cut the cabbage (this is just a quarter head) and some other veg you may have laying around- carrots, celery, apple (that’s a fruit, I realize, let it slide), onions- scallions are really good here… whatever. Cut everything very thinly. Before you put your veg in the bowl, make the dressing- I use mayo, a splash of rice vinegar, some honey, dill (my kids LOVE dill), celery seed, salt, and pepper. Just try different amounts until you learn what you like. Mix it all together, and let it get all cozy in the fridge for some time before you eat it (I like to make this the day ahead). There you go! Now, get your cabbage and get going! Yum!